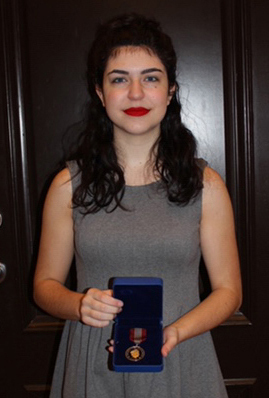 Garibaldi Secondary student Victoria Gardner was writing a biology makeup exam when her teacher delivered the exciting news: she’d been awarded a Sovereign’s Medal For Volunteers! Fortunately, she’d already nearly completed the test. It was going to be hard to focus now. Gardner is a long-serving member of Garibaldi’s ME to WE team and was nominated by the group’s teacher-sponsor, Carlos Silva. “I was thrilled. My whole family loves the queen, and this award is given on behalf of the queen! It started with my mom; she likes the royals,” said Victoria, who is named after the queen. We Day co-founder Craig Kielburger presented the Sovereign’s Medal For Volunteers award to Victoria during a ceremony before the WE Day Vancouver event in November. Victoria joined Garibaldi’s ME to WE group in Grade 8 and has become one of its leaders. The group has raised money to build a school and water well in Ecuador and is now raising money to provide health care in Kenya. Victoria displays the Sovereign’s Medal For Volunteers award. “I like to think I’m a leader in the club,” said Victoria, who always makes a point of empowering younger students in the club to become leaders so they can take on that role when she graduates. “Simply, Victoria has been a wonderful ambassador for our group. Her leadership is often the inspiration and motivation that our group draws from to take action. Victoria has worked tirelessly to make our school a better place while also bringing attention to important issues that affect our community and the world at large,” said teacher Carlos Silva. Victoria’s volunteerism doesn’t end at school. She has also volunteered with Special Olympics bowling, the Pirates special needs softball team, Pitt Meadows Elementary after-school programs, and at Ridge Meadows Hospital, providing company for seniors. “I just love doing it. I find joy in making other people’s lives easier, helping them out,” said Victoria. With high school graduation on the horizon, Victoria doesn’t plan to stop her volunteer work.